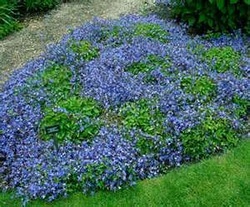 Use this plant in a rock garden, cottage garden, for edging a bed, ground cover, or in containers. Blue Waterfall Bellflower is excellent as a cut flower. It attracts butterflies, hummingbirds, and bees. It is deer resistant and drought tolerant once it is established. It is also a Firewise plant. Divide every two years, in spring or fall.